On this day in 1927 the Deutscher Werkbund opened their latest exhibition in Stuttgart. The Deutscher Werkbund had already hosted a significant expo in Cologne, back in 1914. That one was all about contemporary products used by its membership of artists, architects, designers and manufacturers. Like the its cousin, the Bauhaus, as the Werkbund matured it shed its interest in the smaller arts and focused on architectural design. 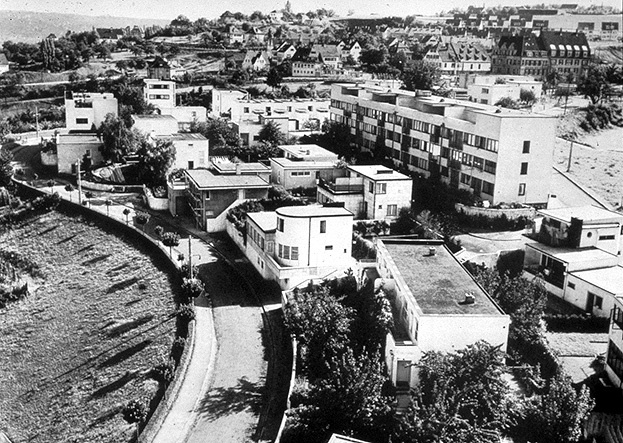 The exhibition in 1927, more specifically known by the German name that has frustrated many an architecture major seated for a history exam, Weißenhofsiedlung, was the most pragmatic and real kind of exhibitions possible: actual, livable houses. Designed by over a dozen architects from several countries (famous names like Mies and Corb, others who have fallen to footnotes like Richard Döcker and Josef Frank), it represented the broad sweep of the Neues Bauen. It is a persuasive message of the international spread of this architectural style, until you remember that all the architects represented had self-selected themselves into the mode when they signed up for their Werkbund card. 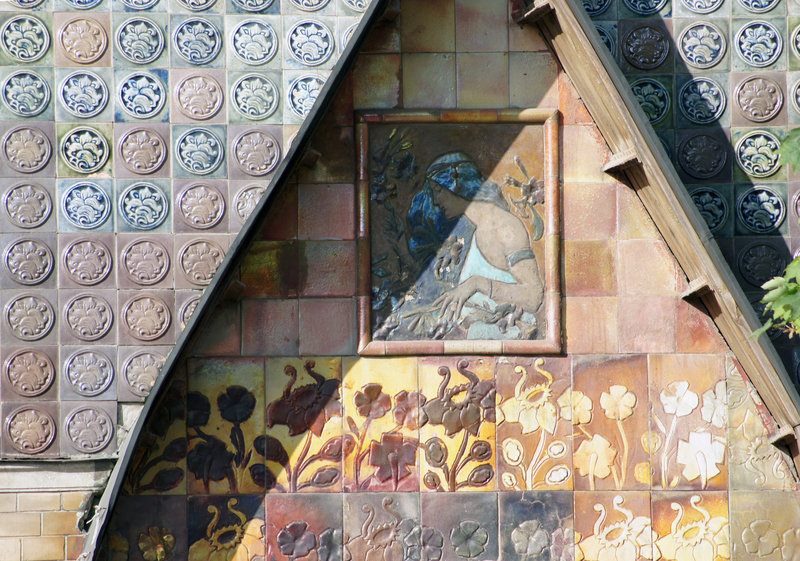 Even so, there’s no denying the importance of the Weißenhofsiedlung, both architecturally and symbolically. For architects around the world eager for something new to pull them out of their post-war blues, the image of les maison blanche was just the thing: new materials (sort of), new structural methods (sometimes), the general image of newness (image indeed). Although this generation had rejected the formal conventions of another White City–finding Uncle Dan Burnham’s demands for a specific era of historical inspiration, specified cornice height, and certain color scheme to be too constricting to the artist’s imagination–they eagerly adopted conventions that demanded an absolute rejection of historical imagery, offered a limited scope of building materials, and approved such aesthetic devices as tube railings and frameless ribbon windows. They did allow a few shocks of color here and there, but no one (especially the Americans poking around MOMA in 1932) knew that looking at black and white pictures of the thing. 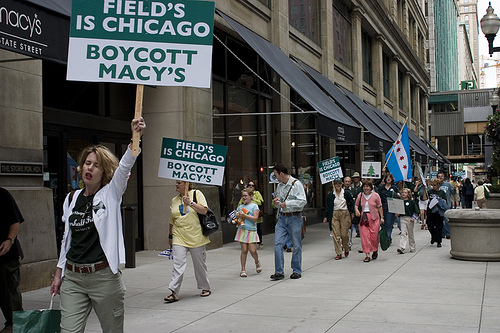 The sure sign that a movement has some legs is not the handfuls of followers it might inspire, but the significance of power brokers it offends. In this case, the Werkbund hit a home run. 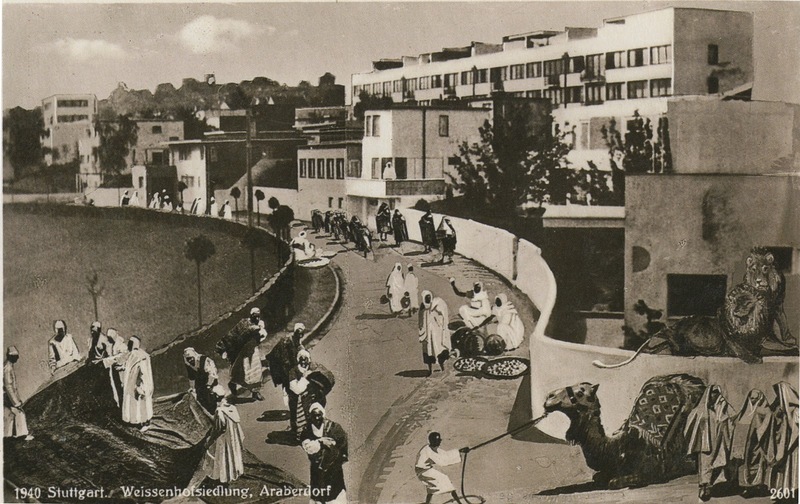 Not much of a fan of modernism, Hitler’s propaganda crews dressed up photos of the Weißenhofsiedlung with camels and turbaned people to align its architecture with maligned cultures. On this day in 1955 Disneyland opened. The 160-acre park in Anaheim was planned directly under the direction of Walt Disney. Its big day was a glitzy but soft opening; “Dedication Day” welcomed only media muckety-mucks, although at-home viewers could tune in to see the proceedings as they were telecast on ABC (an investor in the project). Regular folk got to actually walk through the Castle on the 18th. The original park included five sections. On “Main Street, USA” visitors could ride horse-drawn surreys and fire away at a shooting range (raising the question, what Main Street was Walt thinking of?). “Fantasyland” had (and has) some of Disney’s most iconic amusements: flying Dumbos, the Mad Tea Party, Mr. Toad’s Wild Ride. “Advntureland” still has its jungle cruise and that’s about it. 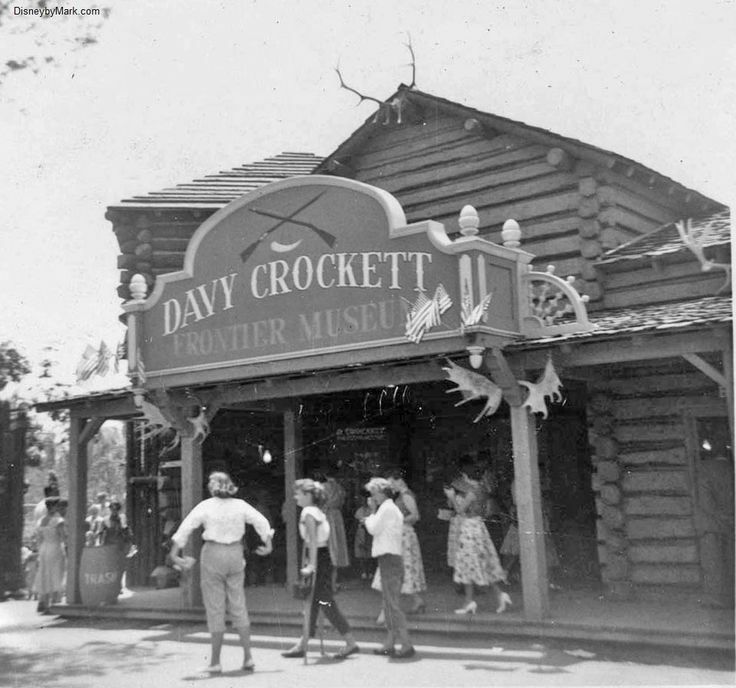 “Frontierland” is the section that aged least well–Davey Crockett, the Conestoga wagon and the Stagecoach Ride apparently didn’t attract enough attention from kids even in the 1950s. 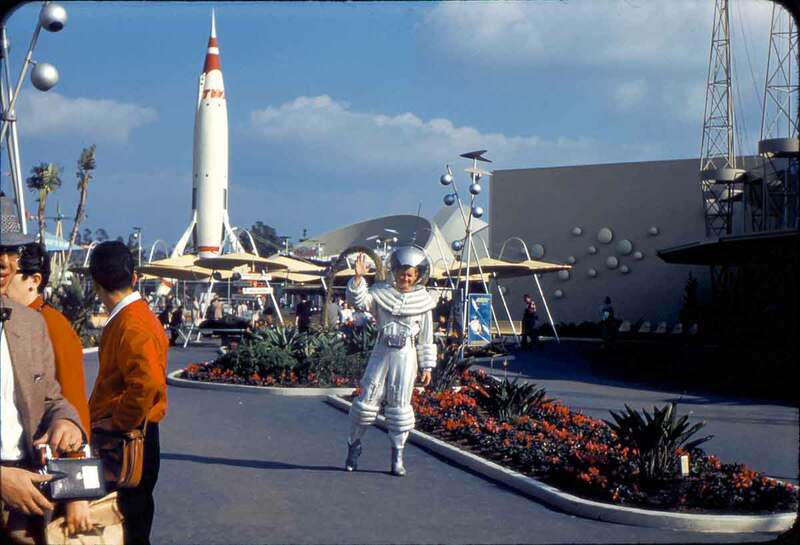 “Tomorrowland” was not just a peek into future-world but a glorious exercise in capitalism: amusements were three-dimensional advertisements for companies from Dutch Boy paint to Richfield Oil. 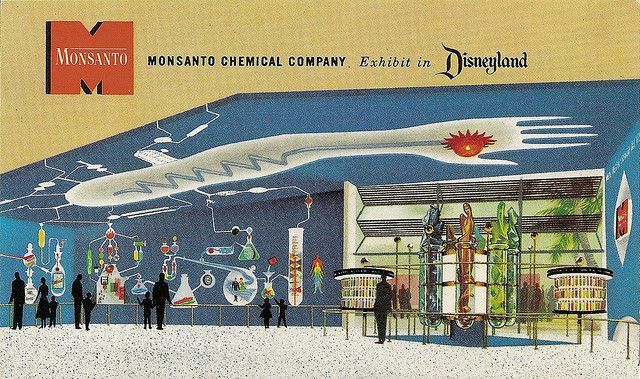 The corporate associations, from the ABC docu-mercial to the Monsanto Hall of Chemistry (no joke) is at first glance pretty crass trade, but perhaps it was just the most upfront and honest part of this whole venture. Disneyland promises to make dreams come true, and that fantasy comes at a price (currently $95 to $120 depending on your age and level of impatience). And really that’s not so much for your ticket to the happiest place on earth. 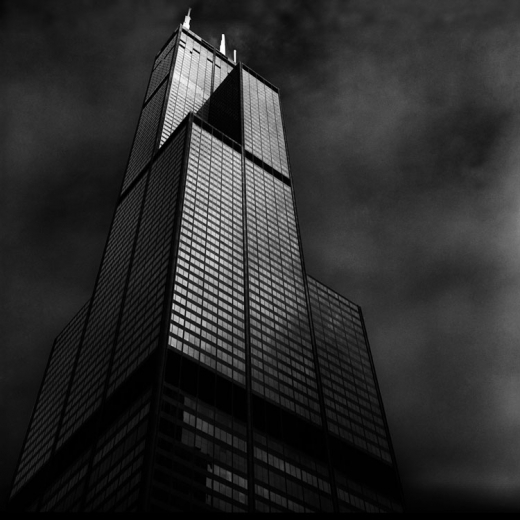 On this day in 2009 the Sears Tower officially became known as something else. On this day in 1841 Otto Wagner was born. Vienna has had surprisingly few great architects bubble to the top of history’s cream like the whip on an einspänner, considering its role as capital of the Hapsburg Empire and epicenter of pastry innovation and other such wonderfulness. Basically there’s Fischer von Erlach (1656-1723), Richard Neutra (1892-1970) and today’s crush, Otto Wagner (d. 1918), who rises to the peak between the two. Truly he is a go-between twixt the worlds represented by the others: ornamented, monumental Classicism and slick, taut Modernism. Wagner’s theory of architecture was based in his concept of the “art-form:” style as drawn from building technology and use. Basically that explains all architecture at all time, but Wagner couched his ideas (in his great 1896 book, Moderne Architektur, which you probably don’t need babelfish to translate) in a discussion of urban challenges, professional particulars, functional requirements and technological innovations specific to fin de siècle Vienna. The engineer who does not consider the nascent art-form but only the structural calculation and the expense will therefore speak a language unsympathetic to man, while on the other hand, the architect’s mode of expression will remain unintelligible if in the creation of the art-form he does not start from construction. That is the core of the thinking manifest in his many achievements, among them the Majolikahaus, Karlsplatz Metro Station, Kirche am Steinhof and Postsparkasse. Really, he could do no wrong, and probably should be credited with others of Vienna’s great contributions to civilization as well as those fancy horses, too. On this day in 1926, Fyodor Osipovich Schechtel died. It’s too bad that not more people outside of Russia study Russian architecture (outside of the onion domes and Constructivism), both for what stands outside of the better-traveled history of Europe and for what stands alongside those better-known developments. Schechtel (b.1859) falls right into line with all the complexity and excitement in the decades surrounding the turn of the century. He started his career as a graphic artist (pals with Chekhov, he provided illustrations for the writer’s first publication) and designer of stage sets before seeking architectural training in the 1870s-80s. Maybe it’s not surprising then that his most interesting buildings have something of the illustrator and dramatist about them.Schechtel’s architecture embraced everything he thought beautiful: Gothic and Moorish elements are blended in with vernacular Russian motifs with an occasional dash Neo-Classicism. His early next decades his projects bristle with an unreigned–but not unruly–imagination rooted in historical precedents. Had Richard Morris Hunt’s Newport patrons had a little more va-va-voom (and had they been Russian), they might have hired Schechtel (Ava Vanderbilt would have been plenty happy in the Zinaida Morozova house). His church designs reveal a reinterpretation of that Byzantine-Russian thing at a truly monumental scale (witness the Ivanovo-Voznesensk). Around 1900 Schechtel caught the fever that had swept through Guimard’s atelier and was beginning to make Olbrich cough all over Darmstadt. 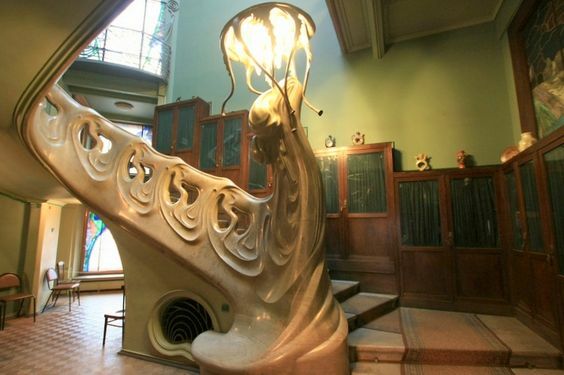 Designing in a self-consciously moderne manner, he incorporated romantic visions of Russian history with the newly revived interest for handicraft (as in the Sharonov House shown in detail above and his Nouveau Riabushinskii house with this stair that would make Gaudí bite his thumb). By the turn of the century he was recognized as Russia’s premiere architect, selected to design the national pavilion at the Glasgow Exhibition in 1901 (seriously just look at this this stuff!). Toward the end of his life he fell under the sway of so-called ‘rationalism’ and gave up a fair amount of the drama in his work, but not all of it. Instead of going the German factory route, he adopted the rationalism of classicism. WW1 killed off most architectural prospects in Russia, and Schechtel’s practice, for the first time, stalled. It may be that his unquenchable thirst for something new, or maybe it was his interest in serving different clients differently, that made him a hard character to get a handle on. Pretty much ignored by the West, he was even disparaged by his own countrymen. In 1911 critic Vasilii Kurbatov wrote “Perhaps because of the stunning flexibility of his talent he could not perfect any of the building types.” Uneven and disparate though his work may be, Schechtel’s architecture is still well worth a consideration and the time spent by an appreciative eye. If nothing else, he reminds us that something happened in Russia between all those pointy domes and Melniknov. During this month in 1933 participants in the fourth CIAM conference travelled from Marseilles to Athens on the S.S. Patris. 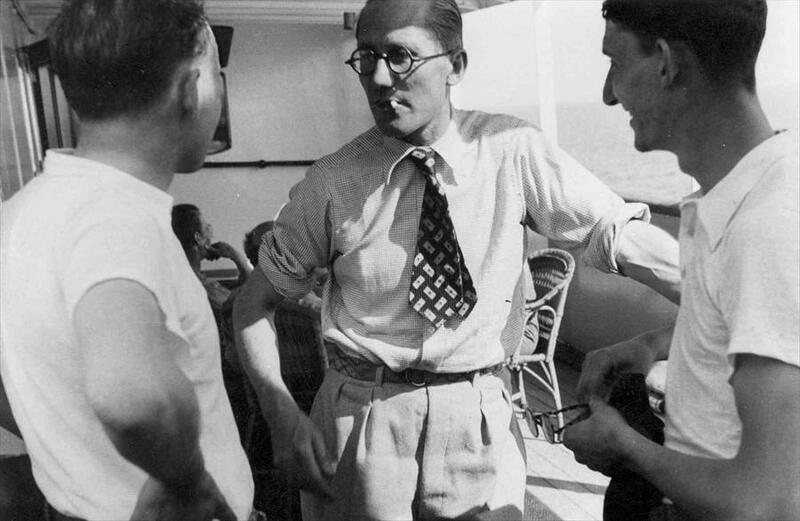 In 1928 Le Corbusier and Sigfried Giedion combined their powers to summon two dozen European modernist architects to form the Congrès internationaux d’architecture moderne (CIAM) with the express intent of ruining the world. Le Corb and Das Zig hypnotized and brainwashed the participants, replacing their abilities as creative individual thinkers with the mind-numbing mantra of Modernism: hygiene is beauty, space is mass, architecture can be made a ‘social art’ by ignoring ‘society,’ and the imposition of absolute formal demands frees architecture from rules it never originally had. In 1933 they gathered their minions on a boat, making it harder for them to escape. As they floated on the Mediterranean, Corb used his powers of persuasion to explain his principles of urban planning: decentralization, severe social stratification, functional zoning, brutal buildings, expansive highways, forgotten gardens, demolition of functioning historic cities. His acolytes dutifully recorded his teachings in the document known as the Athens Charter, which was circulated all over the world. Spooky dark clouds followed, and then: urban ‘renewal,’ ‘slum clearance,’ highways, 20-story public housing projects, vast urban plazas, unwalkable cities. Finally in 1959 the spell of Corb was lifted and the CIAM was disbanded. Slowly, urban planning departments worldwide are coming to their senses. The Muse advises you to take all caution in handling the copies of the Charter that remain in circulation–never enter an architecture library or theory seminar without a basilisk fang at the ready. 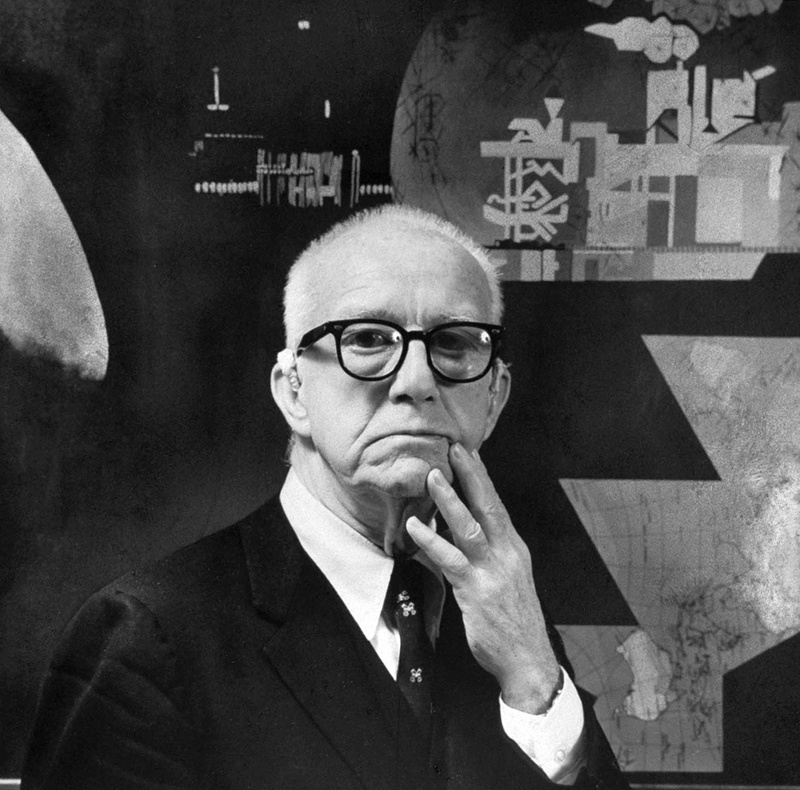 On this day in 1983 Buckminster Fuller died. 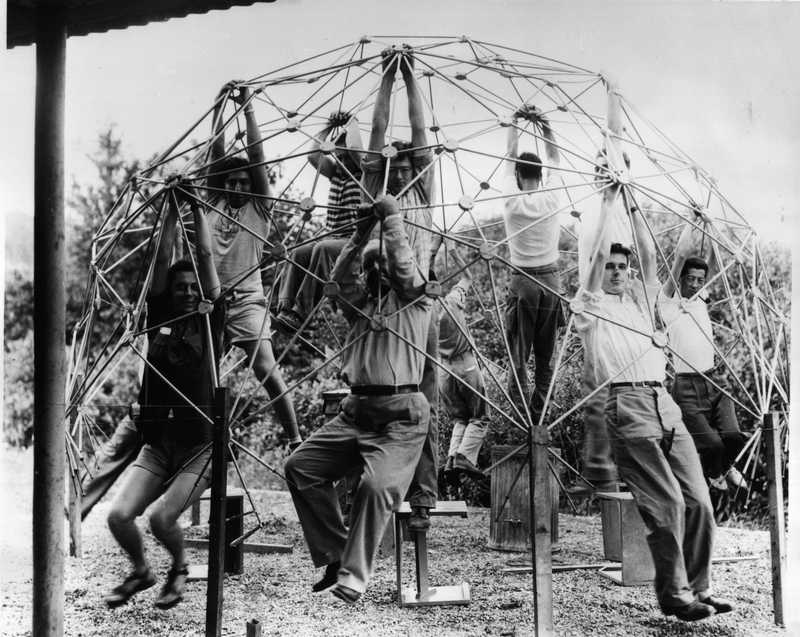 If Buckminster Fuller (b. 1895) was not a real person, he would have been invented by a science fiction writer. His resume is as long as it is wacky; he was a general space-age crazy-genius who spun scientific theories and technological propositions the way most people write up a grocery list. He had serious trouble fitting in at Harvard, for which the Muse salutes him. Plenty of other honors were heaped on him during his life–lots of certificates from science institutes, dozens of patents. We’d love to see his course evaluations from the times he taught at North Carolina State University in Raleigh and Southern Illinois University in Carbondale. Would you not love to serve on a faculty committee with him? Oh yes, yes you would. After a long and tortured start to life (most crazy geniuses have a straight shot up and then fall apart, he did it backwards, so nutty was this cat), things started to click–especially once Fuller started teaching at Black Mountain College in North Carolina, which was a very interesting place to be around 1949. It was there that he perfected his design of geodesic domes that has brought him his most lasting fame. The structures are exceptionally strong for their weight and epitomize the mid-century’s future vision like nothing else except, maybe, jet packs. Fuller published dozens of books and made up (or popularized) terms like ephemeralization and Spaceship Earth and synergetics and Dymaxion. The latter term was applied to visionary projects that Fuller designed for cars and houses. If you want to float off to futurist nirvana, check out this clip of Norman Foster–in an excellent jacket–driving one of them. None of them ever really took off, but their concepts have been influential to other projects and inspirational to generations of future-forward architects. But unlike many of those who forgot that humanity might like to come along for the ride, Fuller always had people in mind. If Modernism has a teddy bear, Bucky is it. He represents a softer side to the era, and would even sing you a lullaby.